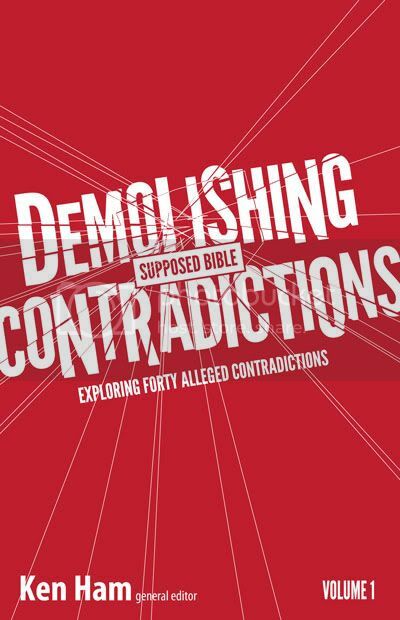 Demolishing Contradictions, edited by Ken Ham, came up as being available for review, and I didn't have to think about it at all. This was one I wanted to read. William and I had recently gone through a whole bunch of information on how to determine whether a document is reliable or not. One thing we talked about was internal consistency, and what the rules were about determining if something is internally consistent. The most critical document we're interested in is, of course, the Bible. So this book, promising to explore forty alleged contradictions, sounded just perfect. One of the most popular misconceptions by people who have walked away from the Church and their faith is that the Bible contains errors or inaccurate accounts. Many people also simply accept without question the claim by others that the Bible is full of contradictions. Even more disturbing is that a growing number of Christians are unable to respond when presented with an apparent inconsistency in the Bible. Now in a bold defense for the accuracy of Scripture, Ken Ham leads a powerful team of contributors in providing core biblical truths to help refute claims regarding the inaccuracy of God’s Holy Word. With nearly two-thirds of young people leaving the Church when they move from home, there has never been a more important time to have a reasoned response for those who desire only to undermine your faith. This book is a great starting point in teaching you how to think and then respond to false claims regarding the Bible. It is imperative that believers are able to stand firm in their faith, and have answers to the culture’s attacks on the Bible. What I love about this book is that it is addressing all kinds of different 'contradictions' in the Bible, and the responses vary considerably. In fact, that is the main point of the introduction, written by Dr. Jason Lisle. He writes a dozen or so pages that is essentially a mini-course in logic. This introduction is quite possibly worth the price of the book all by itself. Anyway -- the contradictions sometimes involve a word that has changed meaning over the years, or a misunderstanding of the cultural context. Some contradictions are wrapped up really nicely. Others are a bit more complicated. After the introduction, the book is set up to go through the Bible in order. So the first chapter is on Genesis and consists of eleven separate discussions by various authors about things like Abel eating meat, the moon shining, or Adam and Eve being told to replenish the earth. After that first chapter, the rest include alleged contradictions from a range of books. Connor is reading this book now, and I planned to actually have him write up a paragraph or two with his opinion, but life has been crazy. He appreciates that it is a pretty skinny, non-intimidating book. Once you get through the introduction, each little section is pretty short, so it is easy to read in snatches of time here or there. He says he definitely recommends this book for teens, and even without finishing the book yet, he feels he now has something to say when friends tell him they don't believe the Bible because it is full of contradictions.